About a few months ago, I was gonna do my handstand when I felt a sharp pain on my right wrist. 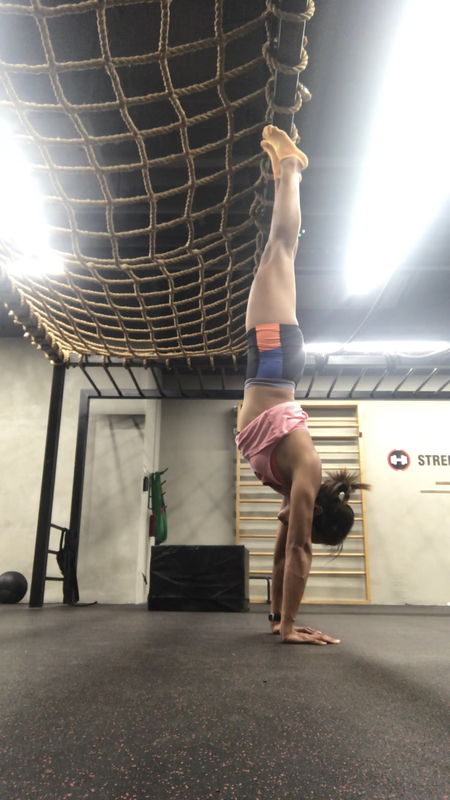 It has happened before and with some shaking and twisting my wrist in different directions, the pain will subside and usually I can get on with my handstands but that day was different. The pain didn’t go away so I thought I would give my wrist a rest. I took about a week off from doing any handstands. Even things like doing push up or pushing myself off the chair or the bed hurts. I wanted to see a doctor in Boston but considering how much it will cost, I decided to wait till I am back in Singapore. Thinking that I won’t be competing anytime soon and it is not preventing me from doing my daily activities, I told him, “no, it is not important.” And I left the clinic with a heavy heart because I chose to do nothing about it and that means I can’t do handstands anymore. When I used to train full-time, every time I have an injury, it will and must be fixed without haste because I need my body to be functioning at its best every single day. It just hit me a little hard that day when I realised that I’m not a full-time athlete anymore. Yes, I’m done moping over it but things like these catch me off guard sometimes, making me miss those times when everything was so much easier. That is what I realised about being a full-time athlete- life was simpler. All I had to do was to make sure I turn up for training and perform to the best of my ability. When it is time to rest, I rest. I know what I was going to eat for the day, I know what was going to happen in the day, I know when I have to be in bed. When I was injured, I knew I had to see a doctor who will refer me to a physio to get the injury treated. And then I would religiously go for rehab every single day, even if I had to drive 2 hours each way for it. I know my life, my body and myself to the tiniest detail. Walking out of the clinic made me wonder if doing handstands were really important to me. I mean, I have been working on it since January and when I finally manage to hold a handstand, it was one of the greatest achievements of my life because it was something I never thought I would be able to do and I was finally able to do it like 7 months later. It definitely made me happy. But, is my happiness not important enough to fix my wrist? Do I have to be competing for it to be considered important? Is this the dilemma people usually go through when it comes to facing injuries as a non-athlete? As long as it doesn’t affect their daily life, they can live with it. I don’t know if I’m able to live with the fact that I am not doing anything about my wrist when there are choices out there to fix it. Yes, it will incur some costs. Yes, there might be side effects. And yes, even by injecting some steroids in it, it might still hurt but I don’t think I’m one to just let something go that easily. I just can’t bear the thought of doing nothing about it, even if I am not going to compete as a gymnast in the near future. But one thing I realised is that I am fully able to take out a boat at anytime and row again. I can sit on the erg and row. No injury is stopping me from rowing again. I used to wish that I had to leave my sport because of an injury but now knowing that I get to choose to leave the sport makes me feel much better about the choices that I have made. As Scott Tinley puts it, “if you get to pick, chances are better you’ll be satisfied.” Life definitely has a cruel, malicious way to make you be grateful. And that book I’m reading, Racing the Sunset by Scott Tinley, oh how it hits home hard. How I had to dog ear every page because I feel everything he says- from the feeling of emptiness when he left the sport, to losing his identity and trying to find himself. Maybe this is normal. Maybe every athlete who has dedicated their life to their sport goes through this. At least I know I’m almost coming out of the other end of the tunnel. Not quite there yet, but I have definitely found the light.